We are officially in the next stage of the never-ending "Is Hillary Clinton TOO Close To Wall Street?" rhetorical exercise. With Hillary&apos;s nomination more of an inevitability than ever, many on The Left are looking for something of a smoke signal from Camp Clinton that it is serious about cracking down on the evil banks. As the idea of a Joe Biden insurrection becomes but a memory, and Bernie Sanders begins his inexorable fade, the Warrenista Wing of the Democratic party will become borderline desperate for Hillary to make some dramatic show of loyalty to party over friendly financiers. But Hillary Clinton is not a liberal. 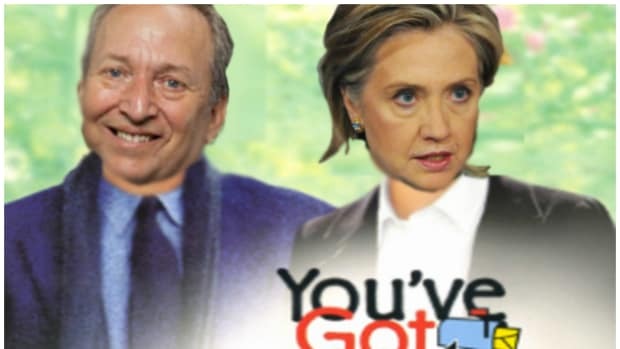 She&apos;s a Clinton. Liberals would love to see Hillary order Steve Schwarzman to pay the college tuition of the entire state of Oregon, or sign an executive order that retroactively puts Brian Moynihan underwater on all his mortgages, but those are really dumb ideas. Wouldn&apos;t it be crazy if some unsolicited Clinton advisors wanted her to do something almost equally crazy and unsubtle though? Until the summer of 2008, Obama has insisted that he was taking advice from both Wall Streeters and the centrists -- from "both Bobs" -- Reich and Rubin. But when he picked his team, it was clear that Wall Street had won. Hillary looks to be playing something of the same game. In 2008, her advice came from the same people who had staffed her husband&apos;s administration. Today, she likes to say that she has been in touch with more than 200 economic experts, representing a broad spectrum of views. But assuming she gets the nomination, who will the power players be? And who will she appoint if elected? Progressive leaders and organizations have been thinking in terms of extracting commitments from Clinton on the issues. But even more crucial are the senior appointments: Who she will name to key positions -- and, more importantly, who she will not appoint. Kuttner refers back to that old tale about FDR telling his people that no one from JPMorgan would serve in any Treasury position under his administration. FDR was essentially looking to send a message that he wasn&apos;t about to let The White House crawl back into bed with Wall Street while the Great Depression was still happening. Kuttner (citing a Harold Meyerson piece in The American Prospect) argues that Hillary should try a very similar tactic and pledge to keep anyone from Goldman Sachs out of top economic jobs on her potential team, something that Occupiers would likely want to extend across the entire private sector. Essentially, the idea here is that Hillary Clinton should agree to a regulatory staffing policy that excludes most veterans of the big banks. That&apos;s akin to promising that you will only read novels written by first-year MFA students because the publishing system is unfairly rigged. In both cases the premise is delightfully altruistic but the results will certainly be very uneven, and likely quite painful. Singling out Goldman Sachs - even if just to make a point - would also immediately and inherently backfire on Hillary. Not only would it close the door on one specific (and very stacked) talent cupboard from which to build an economic team, it would also create an unnecessarily adversarial relationship between The White House and one of the nation&apos;s most powerful financial services company. That&apos;s not how the Clintons roll. Would anyone really buy a narrative in which Hillary Clinton wanted to get into a knife fight with Lloyd Blankfein that doesn&apos;t end with them using the knives to share a dinner at Le Bernadin? Sure, she&apos;s been tilting at the "Quarterly Capitalism" windmill and is now fully-aboard the raising capital gains/killing carried interest loophole train, but almost every candidate from either party has adopted at least one of those stances at this point. So, let&apos;s ask the real question: Why would Hillary restrict herself to selecting from a pool of mostly career public servants when she could pick from people who actually know what&apos;s going on? You know, the people in the corner offices that have been writing checks to her and Bill for all these years. Oh, you don&apos;t like cronyism? Then let&apos;s look at the alternative, which is essentially letting Elizabeth Warren" help" Hillary build a White House economic team like most people build a fantasy football roster. How about giving the CFPB&apos;s Richard Cordray a more powerful regulatory job than the one he already has even though he&apos;s (fairly or not) pretty much despised by Wall Street and has never worked a day inside a financial institution? Maybe Hillary could convince Sherrod Brown to leave the Senate and bring his vitriolic hatred of banks to the FDIC. Or let&apos;s just dust off Brooksley Born and get her back in a top job. Those people are surely qualified to work in government regulatory jobs at the highest level but they shouldn&apos;t be allowed to create a fervidly anti-Wall Street Voltron-esque team. The way this is supposed to work is that Cordray maybe sticks around the CFPB and works with some like-minded people at the OMB or the SEC, but he also has to reach agreement with oppositional voices in other government offices like, perhaps future Treasury Secretary Hamilton James. We make a lot of fun of Donald Trump and Carl Icahn&apos;s dada future in which Carl is running the Treasury Department under a Trump administration, but that reality is no more bizarre than one in which Hillary Clinton sits in the White House without a few private sector samurai in her economic dojo. Basically, this next phase of the "Is Hillary Clinton TOO Close To Wall Street?" narrative seems to be presenting new ideas on an old theme, but unfortunately they seem to be as dumb as they&apos;ve always been. Hillary is very close to Wall Street, and everyone on the left will just have to accept that because she&apos;s the only game in town.